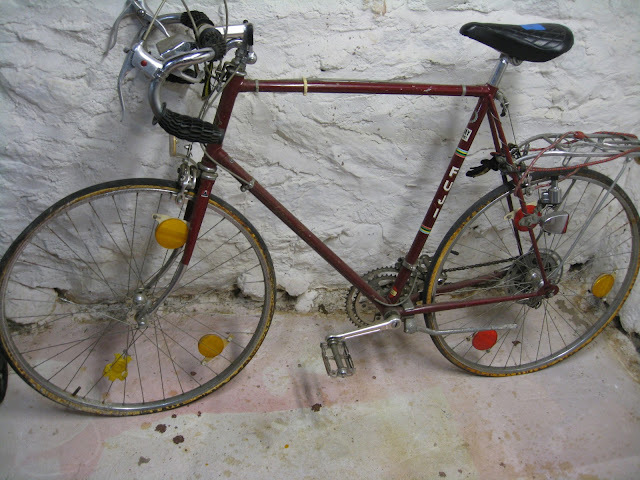 On the last day of a North Stamford estate sale, I paid $15 for this: A Fuji Gran Tourer which had been originally priced at $40. Built in May of 1981, this bike was owned by a man who was very tall. That isn't a guess. I'm 5' 11" and couldn't get on the seat in the position it was in when I bought it. Even when I lowered it all the way I could barely throw my leg over the top tube. I felt like a kid trying to get on an adult's bike. The Gran Tourer had obviously had been loved aggressively and probably hadn't been touched since the first Gulf War. But in its life, the owner had obviously ridden it through fires. If the tires had been stuffed into an enormous toaster, they would probably look like that. 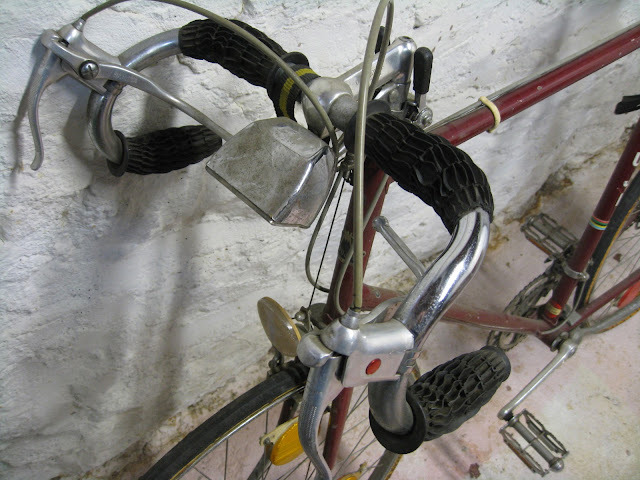 But because I believe the bike was owned by the person whose estate it *was* I couldn't ask where he had ridden it. The handlegrips on this bike, like the Fuji Espirt, were interesting, to say the least. I actually recognize these grips from a 1980s Huffy bike. The owner used four of them on the Gran Tourer. The bike is just too big and too cool for the scrapheap, and I'll give it a proper send off in a later post. 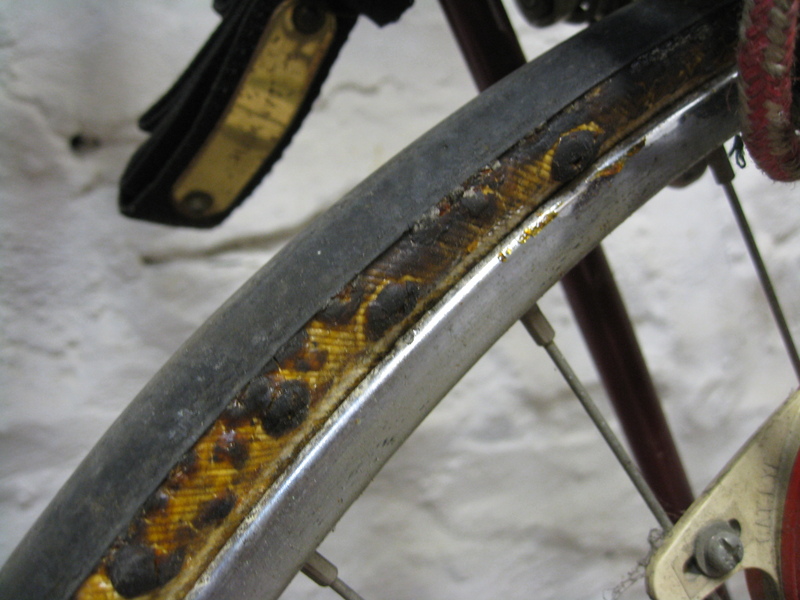 Though the bike had a coveted 27" rear wheel, the condition made me skeptical it could find its way to the recumbent. However, the Gran Tourer features a headlight with a generator kit. Even though the generator itself rumbled over the charred rear tire, it worked, and the light shined. I was admiring the housing and the lens of the headlamp when something occurred to me: I didn't have a bike light for the predawn ride to the station on May 1 for the Five Boro Bike Tour. As noted when I was tuning the recumbent I have a mounting point for a bright but inexpensive bike light right near the enormous chainring. However, in true DIYBIKING fashion, I couldn't find it. I had created that mount before my dad gave me the excellent GeoManGear/MagicShine 900 lumen bike light as a Christmas present. It's astonishingly bright and whenever I've needed to ride at night (mounted on the handlebars of the Dahon Matrix) it's been great: cars actually give me a wider berth at night than they do during the day. I thought about making a mount for that light on the recumbent but I was reluctant to use such an expensive piece of equipment for such a short night ride. I had another reason not to do such a thing: Over the past two weeks I learned that light and another from GeoManGear is being recalled for a fire hazard because of a defective battery. My dad sent me the letter from GeoManGear explaining how I could get a new battery, but the letter stated that there have been "three reported incidents causing fires and property damage" among the 19,500 packs sold. I don't mind those odds and the letter didn't mention if the fires were brighter than the lights themselves, but I'm going to do the right thing and play it safe. So that leaves me interested in the Gran Tourer's light. I had no interest in mounting the efficiency-robbing generator to the recumbent, but I dreamed up another solution. Unlike the custom made tailight debacle this custom headlight was going to work and was going to look cool. I took the headlight off the Gran Tourer and pulled it apart. The tiny incandescent bulb was the first thing to go, and that left me with a very light chrome-colored housing. I rummaged through the 304 and found a AAA battery holder, probably bought years ago at Radio Shack. This was especially nice because it had a switch built right in, which meant less soldering for me if I could make it work. I also found a Minoura Besso Fork Mount Holder which is essentially a tiny piece of handlebar you can mount anywhere on a frame. It took a bit of doing but I attached it to the recumbent, and the headlight's mount attached there easily. A guy walks into Radio Shack and the associate asks "Can I help you?" The guy points to the drawers of LEDs and says "Give me the brightest thing you've got." Here's how the joke ends: for $2.99 I bought a very bright but very low voltage Bright White LED which was about the same size as the small incandescent bulb. After some careful soldering and duct tape I had an LED bulb mounted in a decades-old bike light. I used a match to melt the shrink tubing around the solder points to make it strong, and then I pushed the entire assembly back into the headlight before giving it a quick polish. Given that the light and the recumbent are from the same era, I was happy to see the headlight actually looked like it belonged there. Finally, I dropped the battery pack into the Axiom Power Bag on the frame and threw the switch. The light worked, so I headed up the basement stairs, switched off the lights, then headed back down to see what I had made. As Adam Savage says on Mythbusters: "That's a result!" I was impressed at how the light changed the 'face' of the recumbent. Seeing it switched on in the dark like that reminded me of the scene in Back to the Future when the DeLorean rolls out of the van and stops in front of Marty McFly for the first time. The LED's bright white light is a stark contrast to the sickly yellow of the original bulb. It adds style, safety, and it tells the world I'm taking the GeoManGear bike light recall seriously. As a bonus, it gets me another step closer to the start of the Five Boro Bike Tour. Hi, Do you still have the Gran tourer? I had one as my first racing bike. I have a red one here in Michigan for sale on craigslist.